Dining at Michael Mina in San Francisco was a treat that surprised and delighted this diner from start to finish. From the warm greeting by the host and wait staff to full immersion in the sleek, sophisticated setting I eagerly anticipated a meal to remember. Before launching into the details of the food I have to take a moment and applaud the attention-to-detail which prevailed throughout our meal. Although reprimanded by my dining companion, I couldn’t help but lift the plates to see where they were produced. Of course the server noticed and told us that all serveware had been commissioned by the restaurant (no doubt Mr. Mina himself) and produced by various artisans. A very cool and personal touch carried throughout the meal. 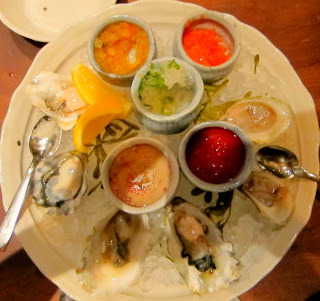 We started the meal with oysters which were good, but the sauces and sides really made the overall experience superb. Pimms cup, bloody Mary and basil French “granita” graced the platter alongside more traditional mignonette and cocktail sauce. “Too ordinary” my dining companion said through slurps and I agreed. 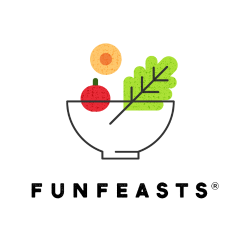 The basil French granita rocked the house – and our table too! The ahi tuna tartar was a sight to behold and mixed tableside with ancho chile, sesame oil, pine nuts and mint. A favorite of mine since dining at the Las Vegas location and a great reminder of how I STILL love this dish! The foraged mushroom risotto was fairly standard in ingredients but amazing in preparation (“the creamiest” proclaimed my dining companion) but it was the lobster potpie that really defined this meal. Less “potpie” and more buttery pastry, it’s decadence turned inside out on a very beautiful and delightful plate. 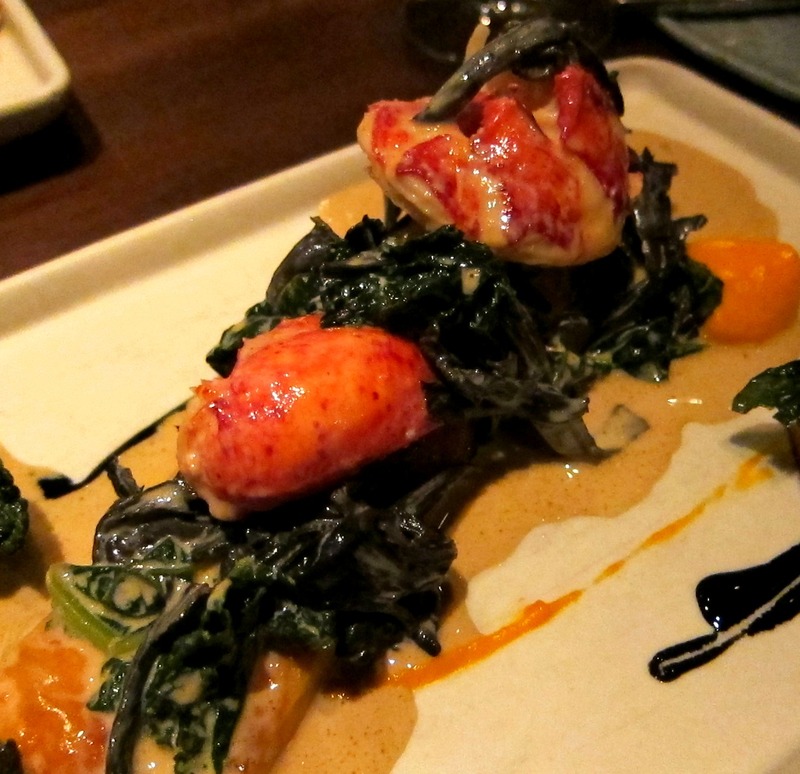 Big perfectly cooked chunks of lobster topped the pastry and were blanketed with a delicious savory sauce. Total perfection and totally devoured. A note to diners: we split this entrée which seemed like the right serving size given the richness of ingredients. While the appetizers and main dishes were spectacular it was truly “the little things” that won me over at Michael Mina. 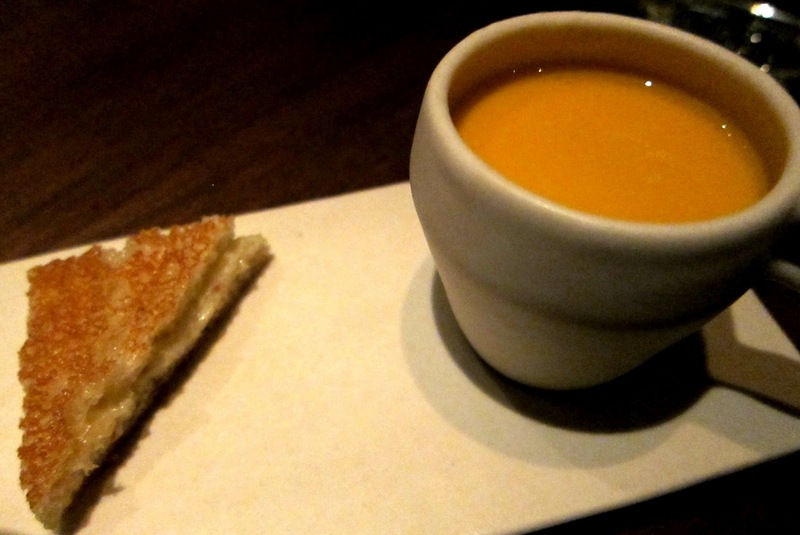 The amuse bouche featuring a mini grilled cheese and ginger-carrot soup on the side was both fun and sophisticated. Rather than the tried-and-true bread and butter, Mina dished out little pots of rich silky ricotta with a swirl of thick honey on top. And the lemony custard dish of sweet at the end sealed the deal: the perfect meal, top to bottom in every way. For me, dining at Mina was the perfect gift for a foodie who loves a memorable, mind-blowing meal wrapped in the glitter and romance of the holiday season. Peace, love and joy to all those I hold dear.